Betsey A. Robinson, Professor of History of Art at Vanderbilt University, here contributes to The Archivist’s Notebook an essay about the history of the reconstruction of the Lion of Amphipolis in the 1930s and the people who spearheaded it; she also reminds us of recent work by the American School in the area in 1970. Her current essay is based on extensive archival research she conducted in the Archives of the American School of Classical Studies at Athens a few years ago, which resulted in an article entitled “Hydraulic Euergetism: American Archaeology and Waterworks in Early-20th-Century Greece,” in Philhellenism, Philanthropy or Political Convenience? American Archaeology in Greece, ed. Jack L. Davis and Natalia Vogeikoff-Brogan (Hesperia 82: 1, special issue), Princeton 2013, pp. 101-130. The Lion of Amphipolis, 1962. Photo ASCSA Archaeological Photographic Collection. Click to enlarge. Tell, lion, whose tomb do you guard, you slayer of cattle? And who was worthy of your valour? The lines above, by Hellenistic poet Antipater of Sidon, are as much of a tease today as they were when Oscar Broneer quoted them in The Lion Monument at Amphipolis in 1941. As I write, each day brings tantalizing new discoveries at Amphipolis where the Kasta Hill is being excavated by the 28th Ephorate of Prehistoric and Classical Antiquities. Less than 5 km to the south, the colossal marble lion that was reconstructed in 1937 has attracted renewed attention since archaeologist Katerina Peristeri and architect Michalis Lefantzis reported evidence connecting it to the mysterious tumulus (http://www.archaiologia.gr/en/blog/2013/04/01/the-lion-of-amphipolis/). Nearly a century after the lion’s discovery, as we await the excavators’ next revelations, it seems a good time to reflect on the lion and its modern history. Following the exposure of ancient foundations by Greek soldiers at a locality known as Marmara on the right bank of the Strymon River, archaeologists Giorgos Oikonomos and Anastasios Orlandos explored the site in 1913. In 1916, British troops uncovered blocks belonging to the lion, and they might have made off with them were it not for a Bulgarian attack. What was a strategic area in wartime remained remote, unproductive, and unhealthy in the peace that followed, and archaeologists were slow to return. Only in 1930 did Paul Collart and Pierre Devambez take a “voyage dans la region du Strymon.” Their report in the Bulletin de correspondence hellénique (BCH) surveyed the ancient foundations and presented pictures of the lion’s remains (1931: 184-90). In 1929, two American firms, Ulen & Company and John Monks & Sons, won a multi-million dollar contract to tame the Strymon and bonify the Serres and Drama Plains. Roy W. Gausmann and William J. Judge, two of Ulen’s top engineers in Greece were well accustomed to Herculean labor; Gausmann had recently directed the construction of the Marathon Dam. They were so fascinated with the lion’s remains that in 1933 they proposed a complete reconstruction to Lincoln MacVeagh, the new U.S. Minister to Greece (1933-41, and later Ambassador, 1944-47—see Iatrides 1980; Robinson 2013). While moving some 46 million cubic meters of earth, the Ulen men were less impressed with the marble architectural fragments that were being dredged out of the river in great numbers. They were believed to have come from an ancient bridge, and to have been reused in a dam or causeway built of reused material as late as the Byzantine era (see Bakalakis 1970). About 60 blocks migrated 60 km north to Lithotopos, probably intended for a modern Monks/Ulen dam, but never used (Miller & Miller 1972: 141). Lincoln MacVeagh was a self-described “specialist in Greek tourism,” (1939), and a great amateur of classical studies and archaeology. He became a friend of the Roosevelt family in his youth, and when Franklin Roosevelt became president, MacVeagh successfully campaigned to become his Minister to Greece. Arriving in 1933, he and his wife Margaret traveled widely, familiarizing themselves with the Greek people, land, and monuments. Their friend Bert Hodge Hill once noted that that the MacVeaghs were “more interested in archaeology than most archaeologists” (ASCSA Thallon Hill Papers). Long before becoming a Trustee of the American School (1941-72), MacVeagh took any opportunity to get involved in archaeology. He sponsored Oscar Broneer’s excavations on the east slope of the Athenian Acropolis, assisting him in the field whenever he could. At the same time he became a great advocate of “things to see in Greece,” especially those beyond Athens and off the beaten path (1939:3). 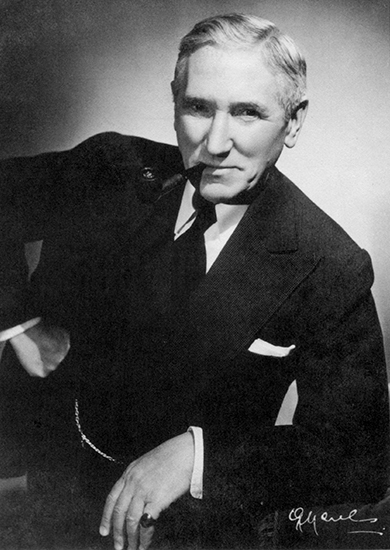 Oscar Broneer, 1930s. Here, supervising the excavations on the North and East slopes of the Athenian Acropolis. When opportunity knocked at Amphipolis, MacVeagh first looked for assistance from the École française, already established at nearby Philippi. By 1934, a permit was in hand, and Michel Feyel began excavating around the Marmara foundation while architect Henri Ducoux measured and drew blocks, aided by local workmen (MacVeagh 1934; 1937; Roger 1939). The French estimate for further study and reconstruction was $5000 ($88,000 by today’s standards according to dollartimes.com). 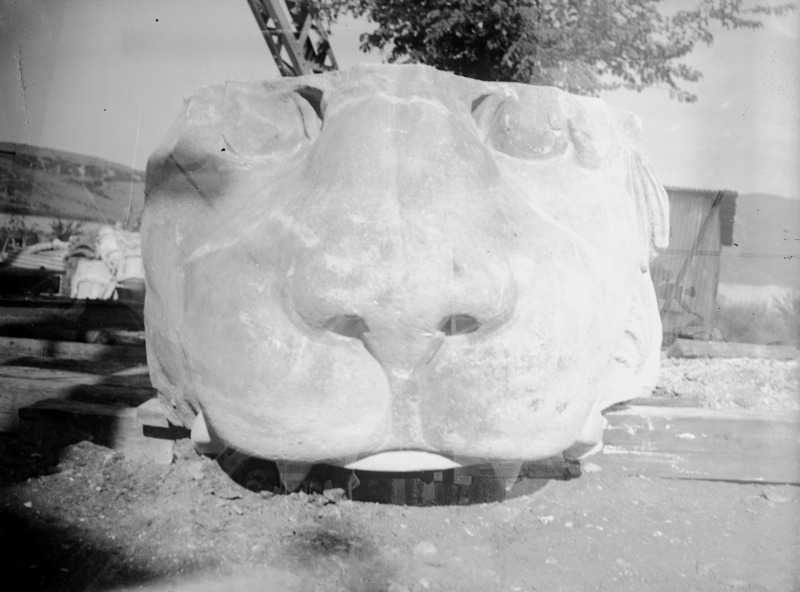 In 1934, MacVeagh circulated “The Lion of Amphipolis: A Plea for its Reconstruction,” a pamphlet describing the lion, arguing for its reconstruction, and requesting donations. Publicity photographs went to international wire services: The New York Times published a picture of a local girl happily leaning against the lion’s snout on November 18, 1934. A large and prestigious group of sponsors answered the call. MacVeagh himself contributed (though he took no credit); Philip W. Allen underwrote the project; and an American School subsidy ensured its completion. Between 1934 and 1936, MacVeagh was joined by 35 other individuals, four Greek-American societies (Athens, Kalamata, Kozani, and Tripolis), the Athenian and Tripolitanian posts of the American Legion, the Archaeological Institute of America, the Royal Hellenic Touristic Office, Monks-Ulen, and one of its financial backers, J. W. Seligman & Co. All were named in a two-page spread within the resulting monograph. American sponsors included diplomats (Erhardt, Morris, Mauricides), lawyers (Cravath, Fearhake), academics (Broneer, Chase, Lord, Sachs, Stevens), fellow expatriates (Davis, Carr), and family (Smith). The most prominent American was Eleanor Roosevelt, along with her brother Hall, an old friend of MacVeagh. Given the importance of tobacco in the reclaimed plains, it isn’t surprising to find tobacco men on the list (Kehaya, Kuhn). 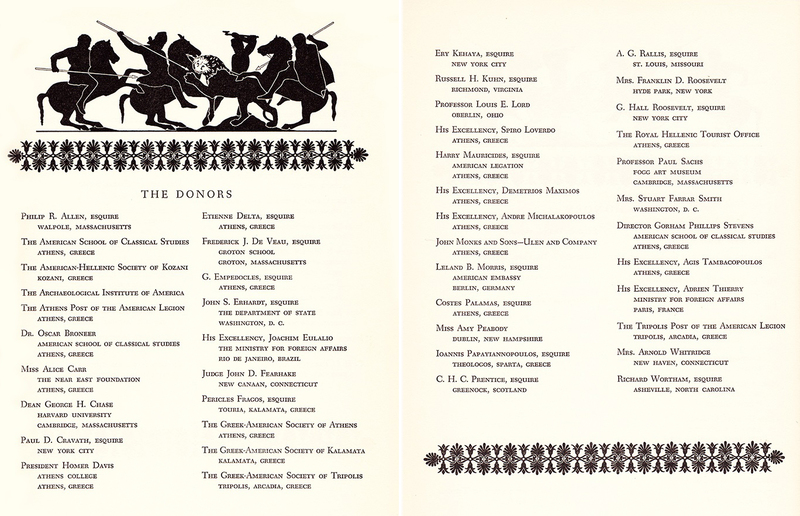 Distinguished Greek donors included statesmen Loverdo, Maximos, Michalakopoulos and Tambacopoulos; poet Palamas; banker Empedocles, and others. France was represented by Adrien Thierry, in the Ministry for Foreign Affairs. The list of donors. Click to enlarge. With incoming funds dominated by American dollars, the American School managed the project, though all archaeological work was jointly undertaken with the École française. MacVeagh praised the “successful maintenance of an international archaeological collaboration which reflects credit on all concerned, and which enables two organizations to guarantee the expeditious prosecution of an enterprise which might, on account of the inaccessibility of the site and the amount of other work on hand, have proved onerous to one alone” (1937: 8). He would be made an honorary fellow of the Archaeological Society at Athens in recognition of his leadership and contributions to the Amphipolis cause. Co-investigators Jacques Roger and Oscar Broneer worked together at the site for eleven days in June 1936, staying at a Monks-Ulen camp. Verna Broneer went along and kept house (ASCSA Broneer Papers). Later, sculptor Andreas Panagiotakes arrived from the National Archaeological Museum of Athens. He worked through fall and into winter, making casts of all remaining blocks, and creating a full-scale plaster copy, a seated lion some 5.3 m high. He sculpted pieces to fill voids, studying context and comparanda (MacVeagh 1937; Broneer 1941). Beside the model in 1937, the original blocks were reassembled with tinted concrete replacing missing sections (following Balanos’s method on the Parthenon – Broneer 1941: 11). The base was a high pedestal of concrete faced with ancient blocks found in and near the river (126 of them with distinctive drafted margins, on which more below). Given financial and material constraints, the goal wasn’t to replicate the original base but to create an appropriate platform. There were higher standards for the lion, “the only part well enough preserved to warrant a complete reconstruction (Broneer 1941: 35). Broneer likened the colossal statue to an “architectural unit,” composed of six courses of tightly fitted blocks, arranged for maximum stability. For instance, vertical joints in the first three courses were set at right angles to each other, and the large blocks in the upper courses were hollowed out to lessen their weight. Parts of the mane, the eyes, the nose, and upper jaw were preserved together in one block, and the discovery of a small fragment of the lower jaw enabled a fairly confident reconstruction of what one of Broneer’s reviewer called “agonized grief” (Fraser 1941: 58), and another, “that Duce look first popularized by the Hellenistic monarchs” (Lawrence 1942: 102). 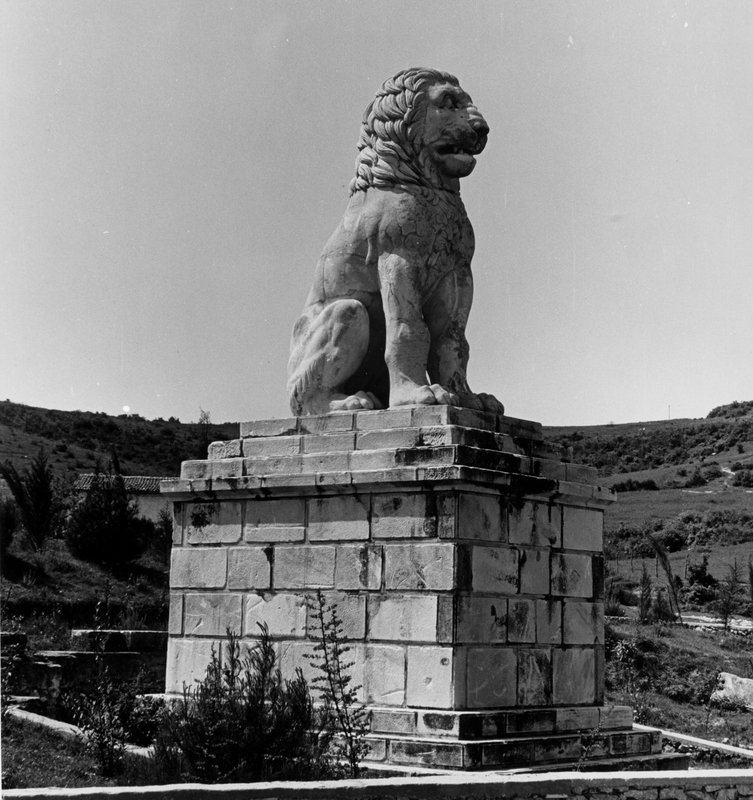 MacVeagh recognized the lion’s potential as a tourist attraction as well as a source of local pride: “Amphipolis is coming back into its own with the emergence of a monument which, as will appear later, must have greatly contributed to its ancient glory and considerably dominated its classical landscape” (1937: 8). Following the lion’s restoration, Roger fairly quickly published his findings (with detailed drawings of the blocks) in the BCH (1939). Broneer was tasked with writing a scholarly monograph that would double as a memento for benefactors. Work became difficult, then impossible after the Italian invasion of Greece. 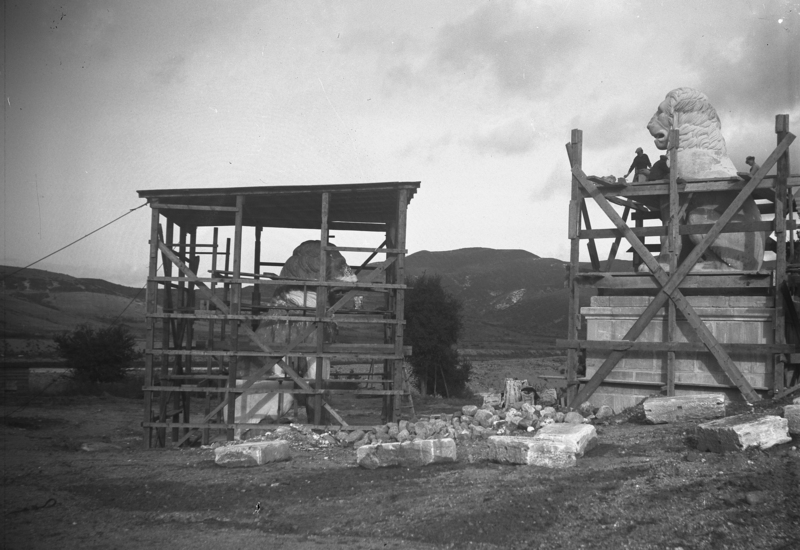 The Lion Monument at Amphipolis went to press as Germany followed in early April 1941 (1941: vii-ix). Recently Dr. Stratis Stratigis, a friend of the American School, dug into his family papers. He reminds us that his grandfather Georgios Nikolaidis, a former minister of railways, inaugurated the new Myrrina-Amphipolis-Tsagezi line on May 5, 1940, in the presence of King George II. The railway followed the left bank of Strymon, and, in passing by the reconstructed monument, gave passengers a unique opportunity to admire the Lion up close. 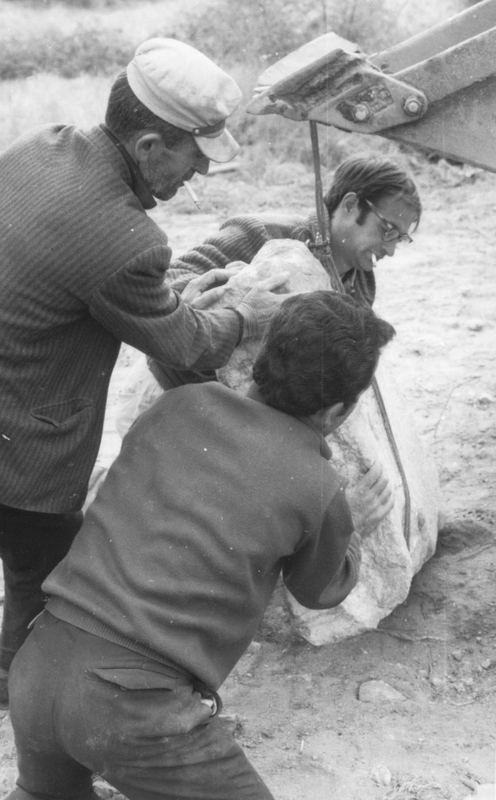 Steve Miller assisting local workmen, Amphipolis 1970. Photo ASCSA AdmRec. Click to enlarge. A decade later, the monument was still one of the American School’s “prize projects,” with its own budget line (ASCSA Administrative Records 204/1). Through the early 1950s, Director Gorham Philip Stevens worked with the American Farm School and Ephor Dimitris Lazaridis to improve the area around the lion. Oleanders and pines were planted, but hard winters and grazers took a heavy toll, and by 1959 the site was as forlorn as ever. Photographs made it back to MacVeagh, who was “shocked” to see the lion still “so exposed in the barren landscape” (ASCSA Administrative Records 204/1). Allison Frantz’s 1962 photo, above, shows trees and shrubs still struggling, but over the decades a copse of evergreens eventually rose up behind the lion, and grass grows around it today. 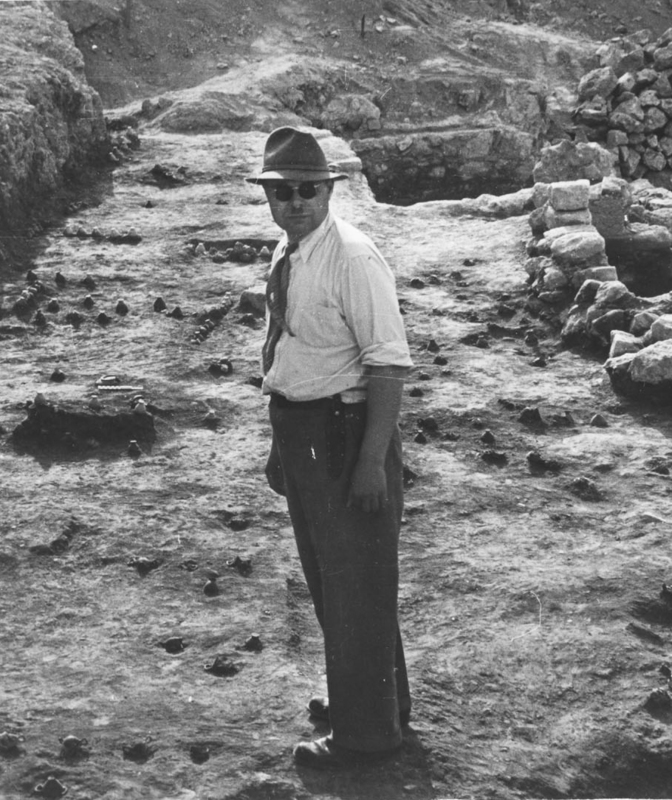 Regretting the disorderly appearance of loose blocks near the lion and on the river banks, Director Henry Robinson initiated the American School’s last act at the site, sending Stella Grobel [Miller-Collett] and Stephen G. Miller to Amphipolis in 1970 to consolidate and catalog blocks for the GreekArchaeological Service (ASCSA Administrative Record 204/1). Assisted by local staff (A. Kochliades and others), the pair found 464 blocks (and catalogued 246) that had been dredged from the river at the site of the ruined dam/causeway. At least six different ancient structures were represented (Miller & Miller 1972). Three blocks hailed from a monument with engaged Doric half-columns alternating with shield reliefs. It was, and is, tempting to associate them with the lion’s original base, following Broneer and Roger (who saw no shield-bearing fragments but reconstructed them by analogy to the Lion Tomb at Knidos [1939: 37, fig. 19]). 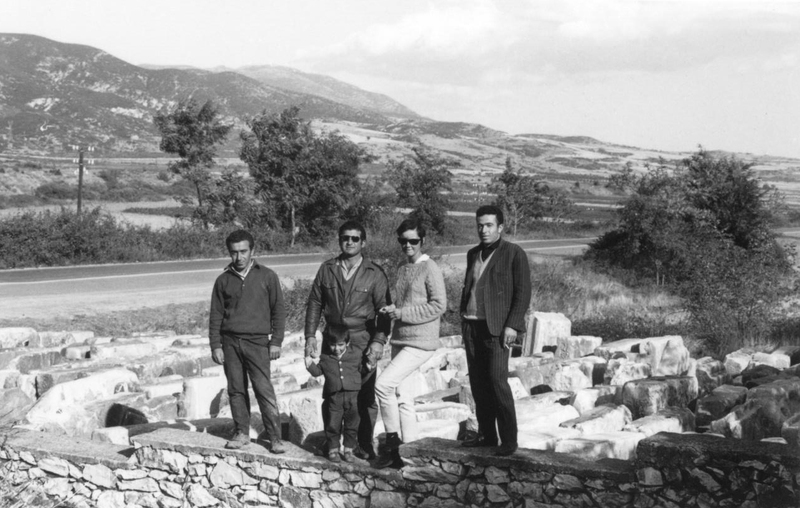 Stella Grobel with local staff, Amphipolis 1970. Photo ASCSA AdmRec. More than 400 marble blocks—the great majority—belonged to a “drafted margin” series from a Hellenistic structure; of these, 126 were built into the lion’s modern base. Remarkably, no backers or corner-blocks were included, and the authors raised the possibility that the blocks came from a monument with a solid core or “a long retaining wall with the back surface completely covered by earth and the geisa surmounted by a rampart or balustrade” (1972: 147). With the Kasta Tumulus, Peristeri and Lefantzis have found such a monument; and they have established that the blocks were created for its circuit wall ( http://www.archaiologia.gr/en/blog/2013/04/01/the-lion-of-amphipolis/). Bakalakis, G. 1970. “The ‘Classical’ Bridge at Amphipolis,” AJA 74, pp. 289-91. Broneer, O. 1941. The Lion Monument at Amphipolis, Cambridge, Mass. (Reviews: A. D. Fraser, Classical Weekly  58; A. W. Lawrence, JHS 62  101-2). Collart, P. 1931. “Voyage dans la region du Strymon,” BCH 55, pp. 171-206. Iatrides, J. O. 1980, ed. Ambassador MacVeagh Reports: Greece, 1933-1947, Princeton. MacVeagh, L. 1934. “The Lion of Amphipolis: A Plea for Its Reconstruction,” Athens, pamphlet. —-. 1937. “The Lion of Amphipolis: A Lecture Delivered Before an Open Meeting of the French School of Archaeology at Athens,” Athens, pamphlet. —-. 1939. “On the Margins of Greek Tourism: An Illustrated Lecture Delivered at the Request of the Society of the Friends of America at the Parnassus Hall in Athens, December 28th, 1939,” privately printed. Miller, S. G. and S. G. 1972. “Architectural Blocks from the Strymon,” ArchDelt 27, Mel. pp. 140-69. Robinson, B. A. 2013. “Hydraulic Euergetism: American Archaeology and Waterworks in Early-20th-Century Greece,” Hesperia 82.1 (Philhellenism, Philanthropy, or Political Convenience? American Archaeology in Greece, ed. J. L. Davis and N. Vogeikoff-Brogan), pp. 101-30. Roger, J. 1939. “Le Monument au Lion d’Amphipolis,” BCH 63, pp. 4-42. That was very enjoyable. I am finishing up Broneer’s papers and there may be more correspondence concerning this topic you might find interesting. If there is anyone you would like me to check, just let me know. Thank you for a beautifully researched article that gives context, offers a personal touch to the characters involved and pricks our curiosity for more. I am particularly fascinated by the discovery of the “architectural fragments that were being dredged out of the river in great numbers”. Their journey in and out of the water is, how to put it, quite invigorating. So, enquiring minds would like to know…whatever happened to the full-size plaster cast?! ?